So I thought I would write about all my cats. So if you are not a cat person, you can stop reading. 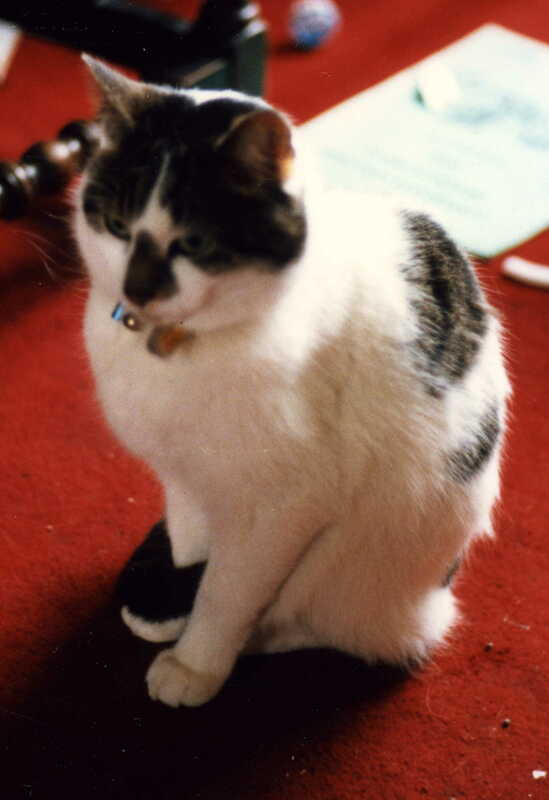 My earliest cat memory is the arrival of Tiptoes, when I was two or three, Tiptoes was ‘my’ cat, only he wasn’t; my cat was Timmy and Mum was passing Tiptoes off as Timmy because Timmy had been run over and she felt I was too young to understand, so a replacement was swiftly found. He didn’t look much like Timmy either, Timmy was mostly tabby, and Tiptoes had much more white on his belly and feet. My memory is of a woman arriving with Tiptoes in a basket, and Mum saying how lucky we were that she had ‘found’ him. I think I thought she had actually kidnapped him, and had only brought him back reluctantly. I definitely smelt a rat, as it were. Tiptoes was very good with us children, and I don’t remember him ever having a cross word. In age he got very stout and lazy, but I loved him. I was very much reminded of him by Judith Kerr’s Mog books. Next up was Leroy, who arrived from a school friend as my sister Rosi’s cat when I was about fourteen. Leroy was black and shiny and full of bounce, and was named after the Queen song Big Bad Leroy Brown; which Rosi hoped he would grow into, but he was always a bit of a stay at home shy thing, apart from disappearing for three days and then wandering in very casually. Leroy had brittle bones as a kitten and broke each of his legs in turn, one of them twice. We were terribly worried the vet would think we were abusing him. Leroy adored my dad, but it wasn’t reciprocated, and he settled into devotion for my mum, which left Rosi catless. I don’t think she minded much. When I left home I was briefly gardenless and therefore catless, although my landlady got kittens for her son, (Gin and Tonic… I wonder what became of them?) just before I moved on. So my first grownup cats were Zappa and Wolfie. Zappa was named for her lightning stripe tabby markings, and for Frank Zappa, and Wolfie for Wolgang Amadeus Mozart, showing my cultural diversity there! They were disappointingly unenthusiastic about music given their namesakes; they both cowered from any rock music, and Zappa was given to stalking the radio if there were choirboys, and hitting it if there was harpischord music. Wolfie left home for two weeks in the middle of a snow storm, and was found by the diligence of my neighbour Melissa who knocked on every door in every street in a half mile radius, long after I had given him up for dead. He wasn’t a bit grateful, and swaggered about with a ‘bad boy’ expression for days, and took to hanging about with a gang of young cats in the neighbourhood, (I never thought they really did that, but it turns out TopCat was based on fact!) and Melissa once found several strange cats in her living room, apparently having a meeting, Wolfie was one of them. Wolfie had an endearing/infuriating habit of leaping at you from the backs of chairs, regardless of whether you were walking away, cooking, whatever; and then digging in his claws to hang on. Not a good trick when the person launched at has just got out of the bath. Wolfie didn’t last long, he was too adventurous, So Zappa was briefly an only cat, which she grew to like. Zappa had opinions and liked to get her own way. If she thought you should get up in the morning she would place a delicate paw on your eyelid and flex her claws very slightly as though planning to prize your eyes open. She once putted A’s watch into a glass of water, in a bid to get us up. It worked, but there wasn’t any breakfast! 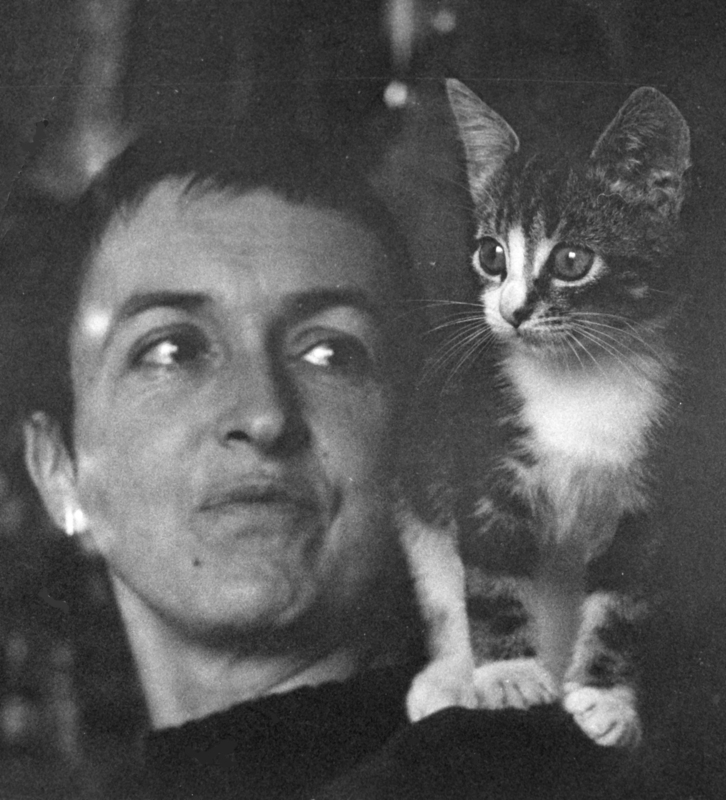 Zappa & Wolfie were the offspring of a next-door cat who was known only as Mother. Subsequently I moved into that house, and assisted in getting Mother spayed after I hand reared (and failed to rear in one case) a brood of 5 that she refused to feed. We gave her a name at this point, Alice, which didn’t seem to make her any more inclined to love her kittens. Alice had a habit of sitting with her feet in her food bowl to show you how empty it was. Unfortunately she liked putting her feet in other bowls too, and there was a bit of an environmental health issue with a pumpkin pie one Hallowe’en… At the point we moved in, she had 3 kittens still at home, 2 from the final litter (Nelson and Lafayette) and 1 from a previous one (Midnight). What she thought about having her daughter back to add to the throng I don’t know. Lafayette was crazy and lived in the basement except when we were alone in the house, when he would occasionally come up for company. It later turned out that all the cats were using the basement (which was unfit for human habitation) as a latrine. We spent an uproarious time cleaning it out, including finding a Gladstone bag completely full of urine. We boarded up the door, and Lafayette had to cope with more company. Alice and her brood, and her human family, later moved to Wales, where Lafayette became a prodigious hunter and only came home if the weather was really cold. Then Cecil joined us. Cecil Robert McDuff, long name for a small cat, another Tabby & White, was found in a telephone box by A’s middle daughter. He lived with us briefly, but got a bad case of adolescence and joined the gang that Wolfie had founded. Zappa disliked him, and once threw him off the bed and across the room, although she would occasionally wash his fur… just enough to make a clean patch for her to rest her head on and use him as a pillow. He allowed this for some reason, but one night he went out on the razzle and never came home. I hope he ran away to sea- it would have been just his style. Then there was Edie. We adored Edie. She was a tortoiseshell, and beautiful. We first met her screaming hysterically on our doorstep. we thought she must have recently moved to the street and got confused, so we sent her away. I feel so bad about that. A week later, I was home in bed ill with flu, and I could hear a cat crying, and saw her on the other side of the road, at someone’s door, and then the local Tom came and boxed her ears, and she rushed across the road into our basement area. I staggered down from the third floor and went to see what was going on. it was pouring rain, and she was cowering in our coal hole. I persuaded her out with food and discovered that the collar she was wearing said ‘My name is Snowball, my home is nowhere, please look after me.’ I was distraught that she had been living rough on our incredibly dangerous road for a week. And now she wouldn’t trust me. We spent a week with both the front and back doors open at every opportunity trying to persuade Edie through to the back garden where she was at least safe from cars and toms. It was cold too! Zappa looked very much down her nose at Edie initially, claiming that she was all fur coat and no knickers, and a painted madam and all sorts. 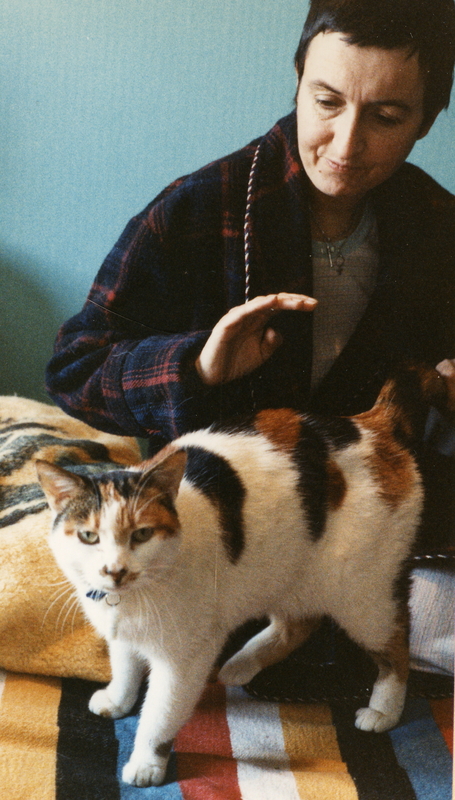 Edie was a charmer though, and Zappa was putty in her paws. Once we had convinced Edie we wanted her to stay, she set about converting Zappa and soon they were playing NATO tank exercises up and down the stairs. Edie had obviously been brought up with radiators, she would lean on the gas fire and there were regular singeing smells and a startled Edie would rush away smoking. She never learnt. We didn’t know how old Edie was, but she was quite mature, and she and Zappa used to lie lovingly in each others arms in an armchair. 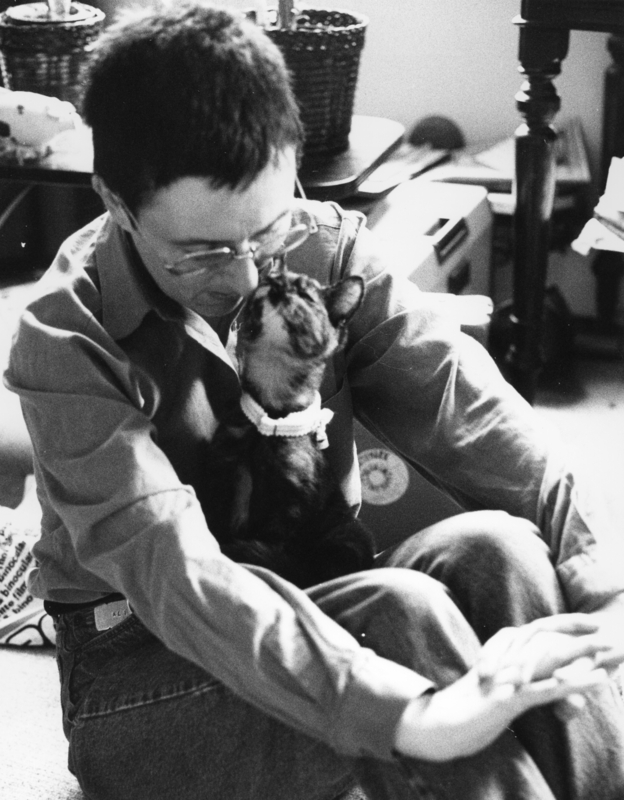 I was glad of this because Edie wouldn’t tolerate sitting on a human lap, she was terrified of being picked up, and the best we could manage was that she would sit beside me with a paw on my knee and purr and purr. We did eventually manage proper cuddles but she had clearly been traumatised. Edie had admirers. There was Vernon, who loved her so much he sat all day in the rain and gazed at her while she sneered from the window sill; and it might have been Vernon, or some other cat, who brought her a pigeon: Zappa held the steps to the basement area like Horatio at the bridge while Edie ate it, then the admirer was sent packing. Vernon actually moved in briefly – that all day in the rain convinced me he didn’t have a home, but he was long-haired, and didn’t suit A’s asthma, and the girls teased him dreadfully. He went to live with a friend, and was teased just as much by her two resident felines, but at least she didn’t have asthma. This happy partnership sadly only lasted a year, Edie was run over on the road behind our house, but not before she had converted a friend of A’ s who had previously had a phobia of cats. Saint Our Edie, as she is still known in our house if one of us maunders on about her qualities for too long. We were worried about Zappa following Edie’s demise, she spent part of every evening around her supper time staring down the garden, looking for Edie; so when A’s eldest broke up with her boyfriend and moved home to her dad with two cats, one of whom retired under the spare bed and refused to come out, we offered him a home. Morph had had too much trauma in his young life, bought from a market stall, coming from a broken home, split up from his litter mate Chas, who had gone with the boyfriend, then introduced into a house with a boxer puppy; he was in the depths of a nervous breakdown, and guess what? retired to the basement. We got him out by putting his food bowl on a higher step every day, and then gradually taking it through to the kitchen. Zappa took offence at him, and he at her. 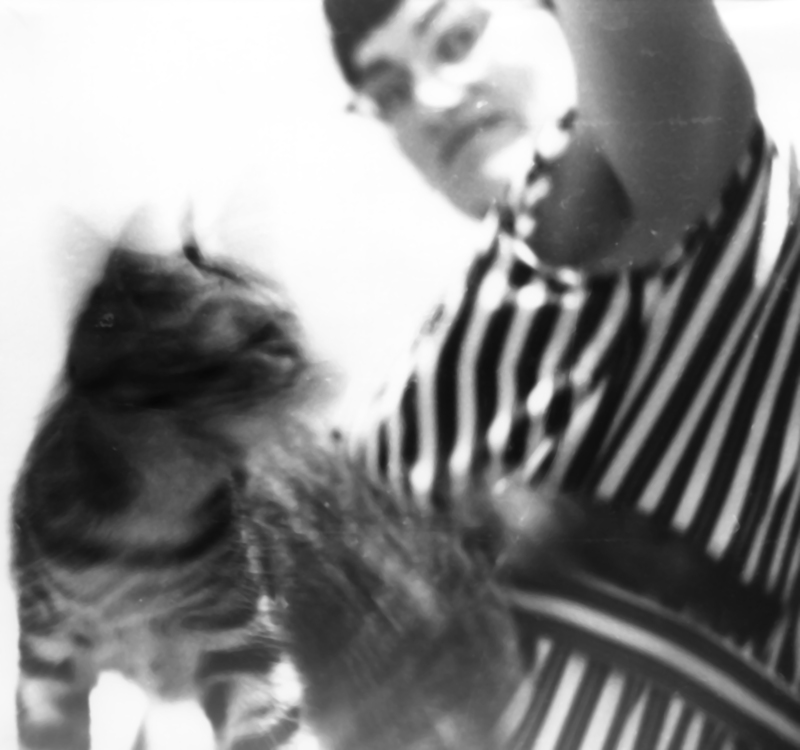 She made a ritual of chasing him up and down stairs every day, and she wasn’t playing as she had been with Edie. It was also clear that they were competing for my attention, they were both fond of A but there was a battle going on to be my chief cat. Shortly after we got Morph clear of the basement, we took on another cat. This was Harriet, and she came from a guy further down the road who ‘collected’ animals. She and her brother were allowed to play in the street, and we were concerned about them having seen cats come and go about every 3 months, including the glorious Gloriana who used to drape herself round my neck in the garden. We went and asked if we could have Harriet. No arguments were proffered and she had a collar round her neck the second she was in the house. Fortunately for everyone, Harriet decided A was the woman for her, and didn’t try to usurp either Zappa or Morph. Harriet settled in and wasn’t going to run away from Zappa, unlike Morph. Morph wanted to be her uncle but she wasn’t interested. It was a pity really, if they had ganged up a bit Zappa would have calmed down. Sadly we never had the chance to find out how this would have worked out, Cats don’t last long in New Cross and Zappa was run over on that @***## road, aged only 7, a few days before we were due to move house to somewhere marginally more peaceful. I’m only half way through this tribute to the felines in my life, but blogs are meant to be short and sweet, and this is over 2000 words, so watch out for part 2 at a later date. This entry was posted in Inspirations, memoir and tagged cats, Cherry Potts, Writing by Cherry Potts. Bookmark the permalink. As a BIG cat-lover, this is divine – what a marvellous writer you are, Cherry! 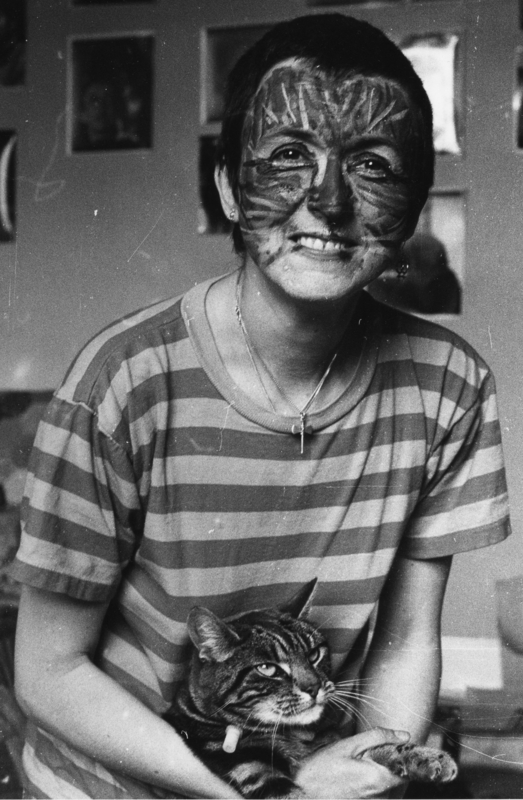 You have brought all these great pusses to life for me – and lovely photos of the youthful A! Do send us Part 2 soon! I shall forward Part 1 to my even more cat-adoring great-nephew Hugo and his sister Ella.